The US team that was not able to compete in Moscow, 1980 Olympic Games due to the US boycott. Back row L-R: Steve Haman, Drew McDonald, Jon Svendsen, Joe Vargas, Eric Lindroth, John Siman, Chris Dorst, Terry Schroeder. Front row L-R: Ken Lindgren (assistant coach), Monte Nitzkowski (Head coach), Peter Schnugg, Gary Figueroa, Kevin Robertson, Terry Sayring (Team leader). 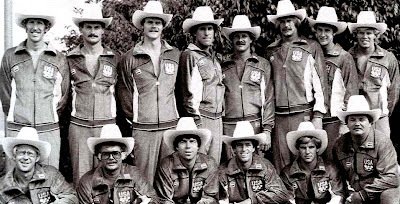 Source: A history of USA Water Polo in the Olympic Games; Photo from the US Olympic Committee.